The present document is a deliverable of the Residue2Heat project, which is funded by the European Union’s Horizon 2020 Programme under Grant Agreement 654650. 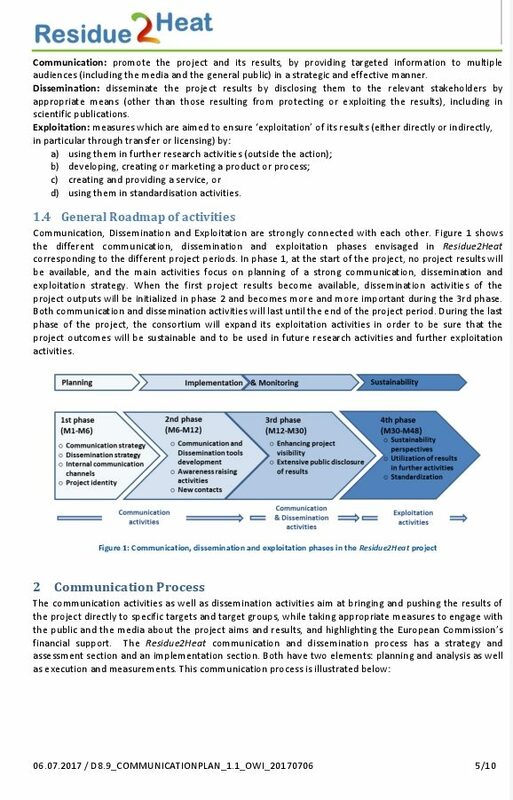 The document presents the project “Communication Plan”, defining the strategy and implementation measures envisioned to efficiently communicate about the project objectives and activities, as part of Work Package 8 – “Communication, Dissemination and Exploitation of Results”. The Residue2Heat Communication plan will be yearly reviewed and updated. The document outlines the communications activities carried out by project partners. It sets out what has already been achieved, and provides an outline of what is planned. An overview is given of all identified communication opportunities and channels such as project publications (e.g. leaflets, newsletters, press releases etc.) and general project presentations (e.g. to stakeholders, etc. ), complemented also by online activities based around the project website, and through the main professional social platforms (e.g. LinkedIn and Researchgate, etc.). The communication activities have been designed to maximize awareness of Residue2Heat objectives.